Bed Bugs are blood-suckers mostly found in motels or boarding houses where travelers stay overnight. Bed bugs are often found in buildings used to store second-hand furniture or clothing. Bed Bugs do bite … at night. Next morning you may see dots of blood in a line on bed linen. The blood has a sickly sweet odor. Also look for dried blood deposits around cracks in the bed, bed-head, flooring, bedside furniture and mattress. How do Bed Bugs get into beds? 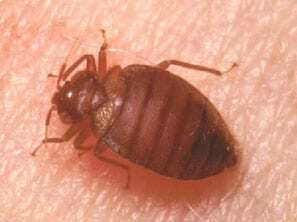 Bed bugs are transported with luggage, clothing and other articles, but not on a person. It is not possible to know if someone is a ‘bed bug carrier’. A professional pest controller like Bug Guardian should be called to ensure safe and effective removal of a bed bug infestation. A thorough inspection of the area of infestation is carried out before proceeding with control procedures. All potential daytime infestation areas are located and treated with an insecticide purposed for bed bugs. Do NOT attempt a do-it-yourself pest control solution using a spray on bed-linens or mattresses. Such use could be a danger to the health and safety of others. Bug Guardian uses specialized equipment with a variety of insecticides formulas depending on the circumstances. In addition to insecticide dusts or sprays the entire area may require treatment using a fogging machine in order to achieve a satisfactory result. All clothing, bed linen, curtains, fabrics and like items must be washed prior to insecticide treatment. Wrap mattresses in in plastic bags and place in the sun for several hours. Seal gaps in furniture, floor boards and cracks in wallpaper and other such areas where bed bugs can hide during the day time. High standards of hygiene helps as an on-going preventative measure. The entire premises should be inspected regularly for signs of bed bug infestation. Prevention of a bed bug infestation throughout a building is more likely if regular attention is provided. Bug Guardian can provide periodic insecticide treatment in any commercial lodging situation where bed bug infestation is likely to occur.